Matt Varga planted a humble garden on the roof of the Peerless Building in Providence less than a year after becoming the executive chef at Gracie’s, a AAA four-diamond award-winning restaurant. He started small, concentrating on growing mostly herbs and edible flowers. “Sage, lemon balm, tarragon, chives – we use these on a regular basis,” he says. Like many gardeners, he quickly grew anxious to plant more, and what started as a modest but thriving operation with a few raised beds expanded into a 1,000-square-foot enviable urban garden a decade later. “It’s a lot of hard work,” says the chef, adding that while “farm to table” might be a popular food movement catch phrase, the garden is the quickest reminder of all the work that actually unfolds between the farm and the table. Varga also says the garden has been a teaching mechanism for the entire kitchen team as they can see and appreciate the seed-to-plate food they are turning into elegantly composed dishes. “It allows my team to be mindful of usage and spoilage – they respect [the food] more… it creates an appreciation,” he explains, noting that the experience inextricably links them to the restaurant’s entire menu planning process. For Varga personally, tending to the garden over the past ten years has been “intense” but deeply rewarding. “It allows me to be more in tune with the seasons… more mindful.” He says it’s also given the kitchen staff an incomparable knowledge of the product, from the spectrum of vegetables including radishes, eggplant, various types of squash, and 26 varieties of tomatoes, to the edible flowers including showstoppers like Johnny jump-ups, borage, alyssum, and bachelor buttons. Many of the herbs Varga grows find their way into teas including chamomile, mint, and lavender, and some pull double duty in infused spirits. Sadly, the Gracie’s garden had to take a hiatus in 2018 due to construction, but Varga assures us it will be back in full gear come 2019. He proudly says he’s found a home for all of his plants during the pause and is eager to get his hands dirty in the spring. For Matthew Gennuso, the mastermind behind Chez Pascal and its pint size partner restaurant, The Wurst Kitchen (with its well-known take-out window), a rooftop garden has been a longtime goal. It wasn’t until last year that he finally sunk his hands in the soil and started to dig. “We had a very big flat roof that wasn’t doing anything for us,” he says. “I thought about it for many years and finally pulled the trigger.” He started with about 40 milk crates, lining them with burlap bags that were originally used to haul corn, and an enviable mix of soil from a farmer friend. Gennuso started simply, mostly planting tomatoes, herbs, and peppers. He observed just how much sun the roof received, explored irrigation ideas, and discovered just how demanding a garden can be. Over the winter, Gennuso collected wooden crates used to deliver the restaurant’s fresh halibut from Nova Scotia. “I convinced the fish guys to give them to me and was secretly stacking them on the roof… the crates are beautiful and idyllic for growing,” he says. In March of this year, Gennuso started seeds at his home and by the time he was ready to plant in May, he had the makings of a robust crop. “The problem is I started too many seeds, thinking they wouldn’t all come up, but they did,” he says with a laugh. With a “no plant left behind” mentality, Gennuso planted every one, admittedly overcrowding a few containers. “But this is experimental,” he explains. Today, multiple varieties of tomatoes plus beans, cucumbers, peppers, herbs, and more are flourishing. While the garden’s harvest is certainly being utilized with ingredients integrated into various dishes, seasonings and garnishes, Gennuso says they certainly aren’t yielding enough of any crop to sustain the kitchen. “All the years working with farmers, we totally respect what they do, and we could never be able to do what they do,” he says. The chef continues to stock the kitchen with produce and proteins from predominantly local farms. 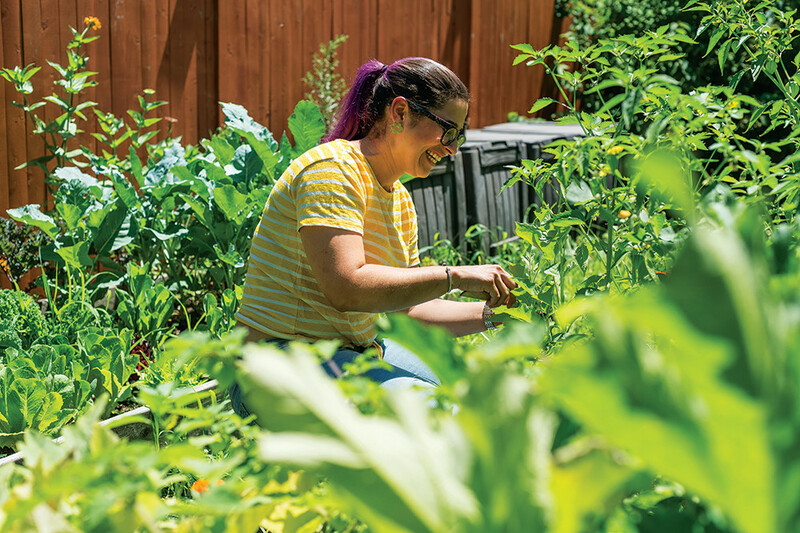 Even before she opened Rebelle Artisan Bagels last year, Milena Pagan has been a gardener, tending to fruits, vegetables and herbs at her home. Undeniably a green thumb, Pagan says she still wants, pardon the pun, to “grow” as a gardener. “I definitely still have some stuff to learn,” she says. While she’s fully aware of what part of her yard gets sun when and for how long and how to irrigate her plants well, she would like to expand her repertoire and grow things based on Rebelle’s menu. “I kind of just grow plants and whatever I think will do well in the yard,” she says. Last year, Pagan started making lavender lemonade from lavender she grew for a refreshing, floral treat. She’s carried over the drink this summer and has also introduced raspberry-lime rickeys, a refreshing, bubbly fruit concoction with New England roots made with raspberry syrup, seltzer, and lime. Any leftover herbs that can be dried and used for later, like the lavender, will likely be incorporated elsewhere in the menu, in addition to the highly-touted hand-rolled bagels, salads, and sandwiches. Herbs including basil and chives, have been a hit in her house-made cream cheeses. “I am trying to do a special pickle with the cucumbers I grow, and the zucchini is coming in to do a bread – which we did last year,” she says. Pagan is also growing more greens like kale in the garden which is tended to by her boyfriend Darcy Coleman. “I come into the garden every day after work and see what’s doing well,” she adds. “The garden gives us a cool story to tell our customers,” says Pagan. The lavender, for example, is so fragrant, and when she tells customers it was just harvested from her home, it gets them interested. “People want to know where their food comes from, it gives people a sense of confidence,” says Pagan.